Facebook asks: what have you been up to? 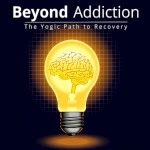 Well, I just came back from Owen Sound where I attended a 9-day immersion course for Beyond Addiction: The Yogic Path to Recovery. This course was developed by Sat Dharam Kaur ND and Jivan Joti Kaur PhD and featured Dr. Gabor Mate. Trouble will follow you as certainly as a cart follows the ox that pulls it. Happiness will follow you as certainly as your own shadow in sunlight. "It's his fault." "She shouldn't have done that."